Unlike last spring, I’ve actually kept up with airing shows this time around! There’s certainly an odd collection of shows to keep track of, for better or worse. I’ve only added a few shows, so these are mostly ones I started the season with. Yahari Ore No Seishun Love Comedy wa Machigatteiru Zoku / We Still Couldn’t Come Up With A Decent Localized Title TOO! Hachiman and Yukino argue. Yui mopes in the middle. Rinse and repeat ad nauseum. Now I’m remembering why I didn’t care for the first season. While the first episode started off pretty well, the majority of the show is uninteresting. The only aspect that really draws my attention is Hachiman’s solutions to people’s silly issues, and even those aren’t anything to get worked up about. I’ll keep watching, but I’m not expecting much from the rest of the show. Yanagi Nagi’s OP is easily the best part. This is definitely my favorite of the season. It’s sort of like K-ON! in a concert band setting, but there’s a much greater focus on the music, particularly the practice for each section. And thankfully it’s been consistently enjoyable, never bogged down by annoying drama or anything boring. 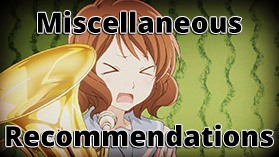 Kumiko is a bit of an odd and indecisive protagonist, not in the Ikari Shinji-esque “Waah waah, I’m a big baby and I don’t know what to do!” way, but more like Miyamori Aoi from Shirobako – she has a general idea of where she wants to end up, but not particularly why or how, so she just goes with the flow. And while Kumiko has abandoned her ponytail from the first episode, another character has taken up the reins of best girl-ness. 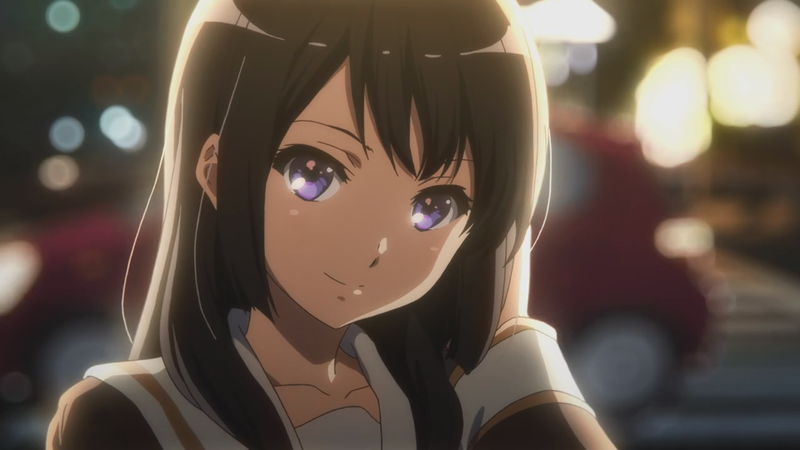 Seriously, if Reina put on a headband, she’d be KyoAni’s version of Akemi Homura, complete with head-tilts and hair-flips. While I’m still enjoying this very much, and while I’m glad that the contrasting tones of the story aren’t conflicting anymore, I have a few issues with this. Many of the events feel very unrealistic, as characters’ logic doesn’t really make sense given the scenario, even moreso than the first half. 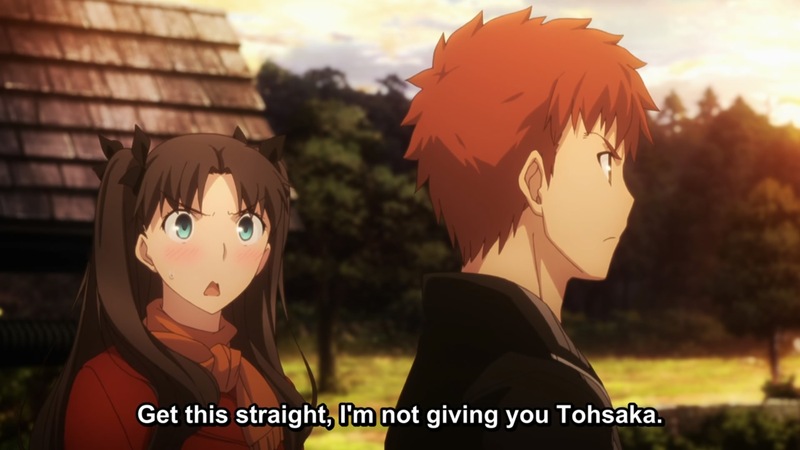 Between this and Fate/Zero, there’s no doubt that I prefer Fate/Zero. There’s not really much to add about this. The show’s still chock full of references and quick-hitting jokes, so I’m still enjoying it. In war, strategy is more important than brute force. Or at least that’s what this show has tried to hammer into my thick skull over the first six episodes. Of course, it’s impossible to overlook the logistics and manpower required to dig canyons in a plain undetected, combined with the precise timing of poor weather just at the start of a battle (which was a pre-requisite for the strategy to work), stupid rumors that somehow caused an entire army to fall apart, and many other plot conveniences. Basically, it was extremely situational and frankly laughable. I’m hoping things improve quickly, otherwise I may not be sitting through the rest of the 24 episodes. The show is very reminiscent of Akatsuki no Yona, but not nearly as fun. The protagonist is just about as feminine as Yona though. If not more so. This is one of the most awkward things I have ever watched. All I can think of when I hear Haruhi is Migi from Parasyte. Nagato’s personality is nothing like it was in the original series. Silly high school drama. Retreading material from the Disappearance book/movie. Koizumi is hardly even a character. I didn’t like this show based on the first episode, and my opinion has not changed. 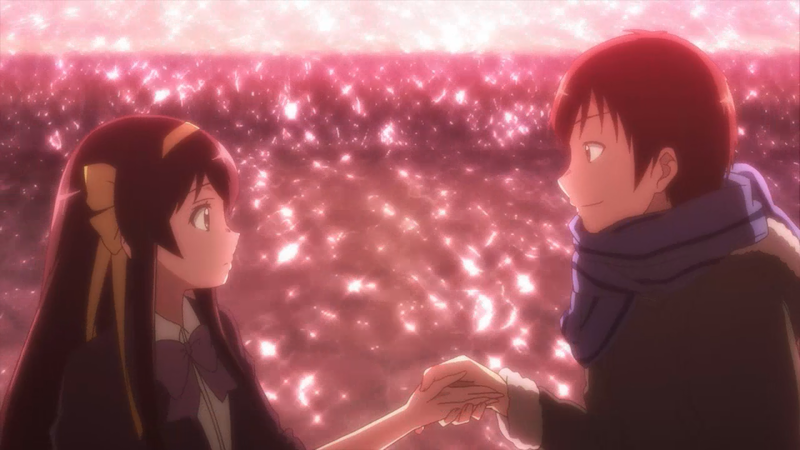 However, the few parts that I do enjoy, besides the occasional jokes that are actually funny, are the moments between Kyon and Haruhi – it’s the same general chemistry from the original series, but without all of the supernatural stuff impacting Kyon’s opinion of her. Yuki is terribly boring by comparison, both as a general character and love interest. The show would probably be far more interesting if it was from Haruhi’s perspective in this setting. Maybe. So far so good, but I’m still worried. The concept leaves itself open to full-on melodrama, but thankfully it hasn’t happened yet. In addition, they’re heading away from an episodic approach, which should help to ease up the potential staleness of the story. How the rest of the show plays out is far more important than what’s already happened. The only good thing about the show. This is like Attack on Titan meets Code Geass, but without many interesting factors. The vampires seem really boring, there’s no mystery to the cause of everything, and the protagonist is obnoxious. But those aren’t even the worst parts of the show! 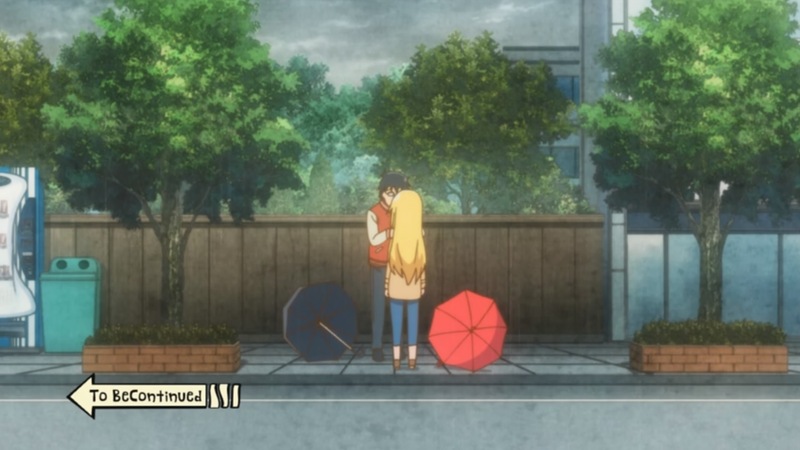 The second episode is about the protagonist making a friend. The second and third cover more generic school life stuff rather than the actual story, complete with rooftop confessions and bullying. After the first episode set everything up, they spent (at least) two episodes mostly ignoring it. I don’t like this show. On the surface it was about this whole humans vs. vampires ordeal, but the first few episodes consisted solely of “I will get revenge!” and “You need to make a friend.” I have no motivation to watch more at this point. Side-note: Scythes are a cool weapon to begin with, but for some reason a girl wielding one makes it 100 times cooler (the obvious example being Maka from Soul Eater). 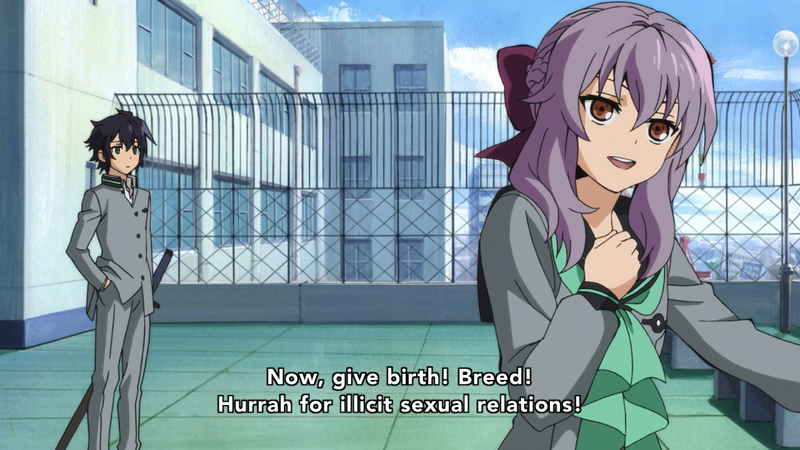 Shinoa is the only reason I would consider watching more. Shokugeki no Souma / Food Wars! Last season, Koufuku Graffiti was an enjoyable food + slice-of-life show. Shokugeki no Souma takes that, cranks everything to 11, and throws in even more orgasmic reactions to delicious food. It’s over-the-top cooking, it’s funny, and it’s sometimes just plain weird. But I wouldn’t have it any other way. I highly recommend watching this show while accompanied by a watermelon and a spoon. I’m watching this, but I’m not caught up. I’ll save my thoughts until the end. After hearing plenty of people praise this, I decided to check it out. However, I’m not thrilled with it. The dynamics between Takeo and Rinko can be funny, but more often than not they’re just awkward. Especially since Takeo is as dense as a brick wall. I’m really not sure where this will go for eighteen more episodes, but I’m hoping something changes up the formula a bit. Dungeon ni Deai wo Motomeru no wa Machigatteiru no Darou ka / Is It Wrong to Try and Pick up Girls in a Dungeon? While I started watching Ore Monogatari because of the praise people were giving it, I decided to check out this show because Hestia, the twin-tailed big-boobed loli, seemed to be taking over the internet with her stupid outfit. The show itself is okay. The setting is like that of a medieval fantasy RPG, complete with many characters that are gods (Hestia, Loki, Aphrodite, etc). Of course, I’m not sure what the point of the characters being gods is, as they’re basically normal people in the story. And I don’t know why they’re all gods from different mythologies. Fortunately, the protagonist isn’t bad, and most of the characters aren’t annoying. It’s nothing special, but I’m enjoying it enough that I don’t mind watching every week. And people say that Trigger make good anime. I’ll be marathoning JoJo’s Bizarre Adventure: Stardust Crusaders and Kuroko no Basket soon so I can get caught up. Other than those, I doubt I’ll be watching much more from the season. 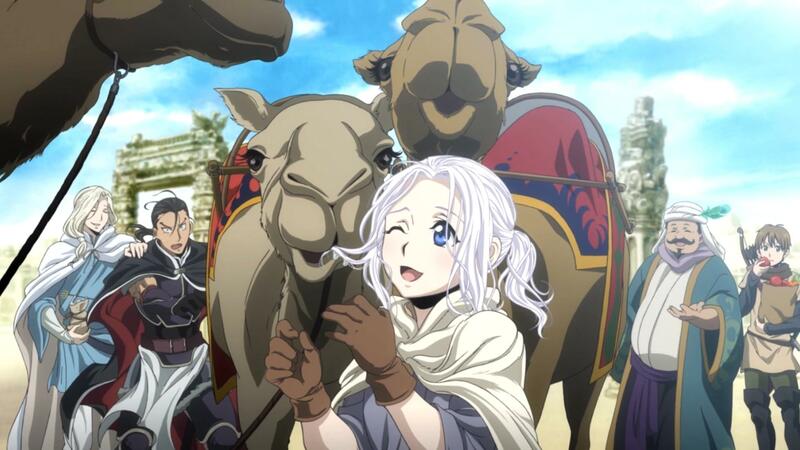 The ‘Plot convenience’ of Arslan Senki is that the enemy magic to call up the fog, and then they didn’t adapt that into the anime for whatever reason, but the fog just didn’t happen, it was created. They didn’t just call it ‘supernatural’ genre for nothing. There was no indication within the show that it wasn’t natural, which is a huge oversight if it acknowledged that in the source material. In fact, there was no indication of any supernatural element within the show itself. Relying on listed genres hardly accounts for that. Perhaps they should have animated more Haruhi rather than tackle that lame spin-off. I’m not enjoying Bizarro Haruhi either. It seems off and is completely without soul. If it wasn’t already associated with a huge franchise, this series would have fallen off the map long ago. I somewhat regret forcing myself to watch this series so I could write about it at the end the season. Great post. Yeah, if this wasn’t a Haruhi spinoff, I would not have watched past the first episode. I’ll probably stick with it to the end, but if it gets unbearable, I won’t hesitate to give up on it.